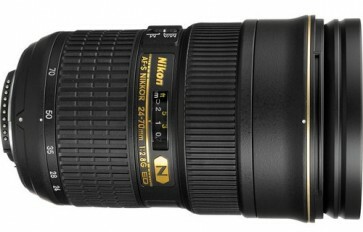 Fast-aperture, high performance wide-angle zoom optimized for FX and DX-format sensors and features Nikon’s ED Glass and Nano Crystal Coat. Balanced, fixed f/2.8 wide-angle to medium telephoto zoom lens , Praised for its reliability and overall image quality, this is a long-time favorite lens of passionate professionals. With a fast fixed aperture of f/2.8 across a 24–70mm zoom range, this lens provides both fine resolution and natural representation. A Nano Crystal Coat helps effectively reduce ghost and flare effects under harsh lighting for greater image clarity. Its Internal Focus (IF) provides fast and quiet auto focusing without changing the length of the lens, so you can retain subject to working distance through the entire focus range.